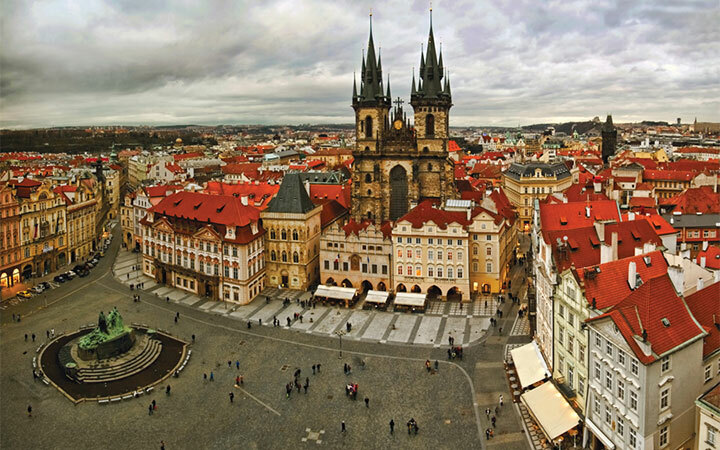 The Czech Republic is a stable and prosperous market economy closely integrated with the EU. The small, open, export-driven Czech economy remains sensitive to changes in the economic performance of its main export markets, especially Germany. Manufacturing is still a major economic activity, especially the production of automobiles, machine tools, and engineering products. Iron and steel industries are important in Moravia. The engineering industry is ranked among the most traditional industrial branches in the Czech Republic. Its most important part is the automotive industry, producing famous brands like Skoda, Tatra, Daewoo, Hyundai and Iveco. A record 900 natural springs have also ensured that the country produces plenty of mineral water. World famous traditional Czech products: lead crystal, glass, cut glass (Moser), porcelain of Karlovy Vary, Bohemian garnet, Plzen beer. The country pulled out of recession in the second half of 2013, and most analysts expect modest, but steady, growth through 2014. The average household net-adjusted disposable income per capita is $17262 a year, lower than the OECD average of $23938. 67% of people aged 15 to 64 in the Czech Republic have a paid job, slightly higher than the OECD employment average of 65%. People in the Czech Republic work 1800 hours a year, more than the OECD average of 1 765 hours. The Czech Competitiveness Strategy is a recent structural reform programme with one target: to place the Czech Republic amongst the top 20 countries in terms of economic competitiveness by 2020. On the labour front, the Strategy includes many recommendations provided in recent years by the OECD, and builds on the recent Labour Code which contributed to higher employment flexibility by allowing more adaptable working hours. The Competitiveness Strategy strongly increases the offer of part-time jobs. Other actions favour the integration of groups such as those over 55 and women with young children. In the case of young mothers, concrete solutions include increasing the availability and quality of preschool education. 92% of adults aged 25-64 have earned the equivalent of a high-school degree, well above the OECD average of 75% and among the highest rates in the OECD. An estimated 82% of the top 20% of individuals with at least a tertiary education have a paid job, compared with an estimated 22% for those without an upper secondary education. Czechs can expect to go through 17.9 years of education between the ages of 5 and 39, more than the OECD average of 17.7 years. The Czech Republic continues to increase funding for the education sector. The Czech Republic has been among the top eight OECD countries in terms of increases in spending (primary, secondary and post-secondary/non-tertiary education), raising expenditure by 25% (OECD average: 17%). In 2010, the Czech Republic reported the second highest growth in expenditure by educational institutions at the tertiary level with an increase in spending by 40%, twice the OECD average increase of 20%. At the same time, the Czech Republic experienced the fourth-highest increase in the number of tertiary students among OECD countries (32%), well above the OECD average increase of 13%. The Charles University in Prague, The Masaryk University, the Czech Technical University in Prague, the Palacky University-Olomouc, the Institute of Chemical Technology in Prague have been listed by the Center of World University Rankings in 2014.